I've tried to piece them into a narrative of the development of the site, and each day this week I've been going back in virtual time to expose some of the hidden archive gems of bbc.co.uk. I started by looking at the Budget 97 site from November 1997, and yesterday I looked at Diana Remembered from September 1997. 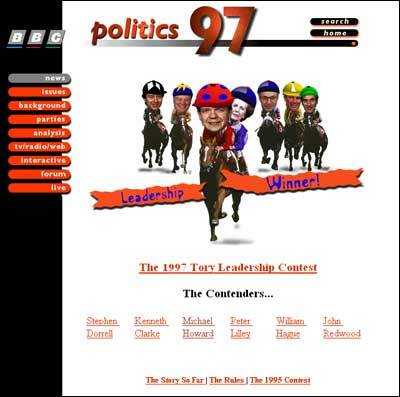 Today I'm going to look at a large area still available on BBC.co.uk - Politics 97 - the forerunner of BBC News Online. The homepage uses a graphical navigation to cover major issues from that year - the death of Diana, the race for the leadership of the Conservative party, devolution referendums in Scotland and Wales, the 1997 General Election, coverage of party conferences and the handover of Hong Kong from the UK to China. There is also an archive of individual news stories which goes back to May 1st 1997. A couple of the items in the homepage graphical navigation are animated gifs. Still, the more things change, the more they stay the same - look at what was making the headlines in the 'issues' section of the site 8 years ago - Constitutional Reform, Education, Crime and Punishment and Human Rights. Alongside these are the European Single Currency, the introduction of which on mainland Europe was still some way off, as the adoption of the Euro in the UK still is a long way off. There is a very striking difference between the worlds of 1997 and 2005 illustrated on the page of the site devoted to promoting the BBC's political coverage on TV, Radio and the web. It is unlikely now that any BBC website would direct the user away from the web and onto Ceefax with the promise that your television had up to the minute news in more depth than bbc.co.uk - but only, of course, "if your television is equipped with teletext". The site also incorporates an 'about' section which features a column 'The Editor Writes' by then editor Nigel Charters. Welcome to the BBC Politics 97 website. The Devolution debate is gathering pace ...and we're there with it. Over the next few weeks we will be reflecting the discussions and debates in Scotland and Wales and the broader constitutional issues for the rest of the United Kingdom. There will be debates and forums about the common issues and those which are distinctly Welsh or Scottish. There is plenty of opportunity for you to get involved. There will also be informed comment from BBC correspondents and we will be watching the ups and downs of the polls. We are already planning our coverage of the voting days themselves. Beyond that, we are at work planning the coverage of the British political party conference season. Please write to me and let me know what you think of our site. "There's no point embarking on a column like this without taking the rough with the smooth, and this week has been dominated by the latest announcement from director general Mark Thompson on job cuts. A fair bit of the detail was covered by us here - BBC to cut 2,000 programme jobs and here - BBC job cuts at a glance, followed by union anger: BBC faces strike ballot deadline. Several of you have written to ask what it means for this website. The 15% cuts proposed over three years apply to most areas of the BBC, including BBC News Interactive - which includes this site, the Ceefax and digital text service and interactive TV news. For us it means a proposal to close about 12 journalism posts directly related to this website in the coming year. We have yet to finalise our plans for years two and three, but by the end of that period we are planning to have trimmed £4.3m from News Interactive's total annual budget. Another big contrast with the current operation, even allowing for job cuts, is the size of the team. Back in 1997 the team producing the site was small enough to all be credited on one page - and had enough time to make that page. I think the notion of 'credits' on BBC web pages really brings home how the organisation brought a very television and broadcast focus to the production of online content in the early days. Tomorrow I shall be looking at what remains on the BBC.co.uk live site of the BBC's first ever online General Election coverage. By Martin Belam on 30 March 2005.